Dill is a popular herb that gives a tangy flavor to a variety of recipes such as pickles, salad dressings and fish dishes. The flavorful herb is native to southern Russia, western Africa and the Mediterranean region. It was once highly valued in ancient Greek and Roman cultures for its many health benefits and healing properties. The beneficial herb is now commonly used in the cuisines of Scandinavia, Central Europe, North Africa and the Russian Federation. Dill is a renowned appetizer, and its essential oils are found to stimulate the secretion of bile and digestive juices. The essential oils in dill are also known to activate peristaltic motion in the intestines, which in turn facilitates easier bowel movement and relieves digestive issues including constipation. Aside from this, dill is touted as a potent carmitative that relieves excessive gas. Additionally, dill is touted for its digestive and antimicrobial properties that help alleviate and prevent diarrhea. Dill is also known to reduce acid secretion and prevent the development of stomach lesions. The flavorful herb is also touted for its beneficial effects in diabetes management and prevention. Dill is notably effective in controlling blood sugar levels and reduce the fluctuations of insulin levels and serum lipids in the body. Besides this, essential oils extracted from dill are found to bolster the immunity and promote thyroid functions in patients who already have diabetes. Likewise, the medicinal herb is touted for its positive effects on the body’s nervous system. The high flavonoid and vitamin-B complex levels in dill oils are known to stimulate the secretion of certain enzymes and hormones that otherwise contain both calming and hypnotic effects. This in turn, helps promote good sleep and ease symptoms of insomnia. In addition, the antimicrobial properties of dill are touted to prevent the onset of wound and fungal infections. The herb is valued for its bone-promoting effects as well. Dill is an excellent source of calcium, which in turn prevents bone loss and bone density depletion. In turn, the herb lowers the odds of developing osteoporosis. Besides this, the medicinal herb’s anti-inflammatory properties are known to ease pain linked to rheumatoid arthritis, gout and arthritis. Moreover, dill is touted for its potential in cancer prevention. The herb is known to contain a compound called monoterpene, which boasts with chemoprotective properties. The compound stimulates the secretion of the glutathione-S-transferase, an enzyme that effectively neutralizes the effects of carcinogens. The herb’s potent antioxidant content also contributes to its powerful anti-cancer properties. Furthermore, dill contains an ample supply of kaempferol, flavonoids and monoterpenes that have anticongestive and antihistasminic properties. This makes dill an ideal respiratory system aid against congestion caused by histamine, allergies or coughs. On the other hand, the high flavonoid content in dill is touted to maintain a healthy menstrual cycle. Dill is also an effective diuretic that eliminates excess water and maintains a healthy urinary system. Dill is found to promote a healthy digestive, urinary, and immune system. Likewise, the herb is essential in maintaining healthy respiratory, skeletal and female reproductive systems. Dill is most commonly used in many fish recipes, particularly salmon. The flavorful herb can also be incorporated in poultry dishes. Likewise, dill can be used in various vegetable recipes, soups, pickles and dips. 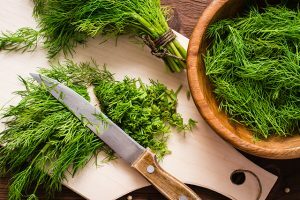 AllRecipes.com has curated many interesting dill recipes across the web. Dill prevents cancer, diabetes, and digestive issues. Dill staves off osteoporosis, infections, and respiratory conditions. Dill benefits the digestive, urinary, and immune system. Dill also supports the respiratory, skeletal, and female reproductive systems.